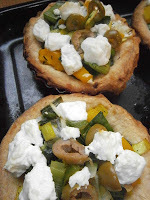 Here is a nice salty tartlet recipe. For this, you will need to prepare a pie crust (recipe here). Prepare the pie crust and leave to rest for 1 hour. Then, spread it and put it in 4 tartlet moulds (or a large one). 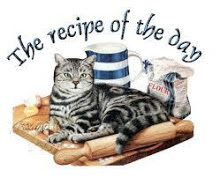 Pick it with a fork and bake it blank for 15-20 min at 180°. Meanwhile, cut the leek, the bell pepper and the goat’s cheese into small dices. In a frying pan, brown the bell pepper and the leek for about 8 min. Add salt and pepper and sprinkle with thyme. 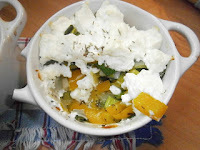 Be careful, goat’s cheese is naturally salty, so do not put too much salt on the vegetables. 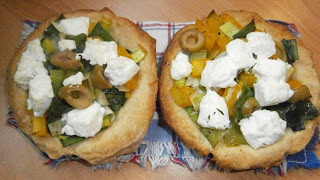 Put the vegetables on the baked pie crust, and then add the cheese and some slices of olives. Bake in the oven for 10 min. I had too much vegetable, so I put the rest in mini casserole dishes, without any pie crust. It was great too.